Toilet train your pup and keep your home clean with Simple Solution puppy training pads. These pads absorb liquid, traps smells and turn blue to signal a change is needed. Simply place these pads on the floor – plastic side down and tissue side up. Pheromones will attract your dog to the pad to relieve themselves. When they do, multiple layers trap the urine and contain the smell. The pads turn blue when used so you know when to swap with a fresh one. If you’re toilet training your pup, Simple Solution puppy training pads are a must. Place pads in an area of the house you’d rather your pet goes, such as a utility room or near a back door. Introduce your dog to the pad, letting them smell and get used to the pheromones, which will encourage them to pee there. Keep steering your pet back to the pad until they’re ready to use it, especially after mealtimes. When your dog successfully does their business, reward them with a treat and lots of praise. To encourage your pet to go outside, you can move pads closer to the door and even outside to get them used to outdoor toilet trips. As well as training pups, these pads are great for dogs who live in high-rise flats for those just-in-case moments. Tried three or more, these are the best so far. 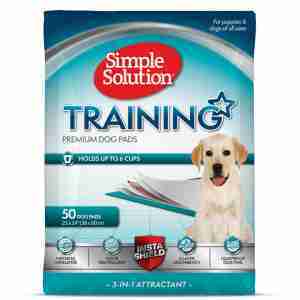 These pads worked really well for us while we were toilet training our Pug puppy. They were especially useful at night. Our puppy was definitely attracted to the pads and would always go on the pad rather than on the floor! He is fully potty trained now so they have served their purpose.